Check out this absolutely precious cake. This four-tiered beauty was the star of the show at Melissa and Heath’s wedding, which took place in 2006. The couple had never been to Disney before going together while they were dating…and they were instantly hooked on the magic. They even considered getting married at Walt Disney World, but opted for a hometown wedding, and a cake that served as an homage to their favorite vacay destination. The four-tiered, stacked cake is iced in buttercream with a pale pink lattice design covering the entire cake. At the junction of each lattice crisscross are simple red flowers with white centers. The effect is finished by a shell trim. It’s a simple design, and rather traditional, but executed flawlessly. 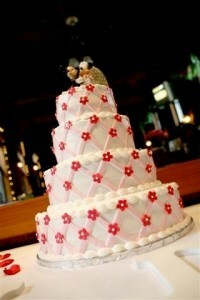 Perched on top of the cake are Mickey and Minnie in their wedding finery. Melissa tells me that Heath isn’t much of a cake fan, so she had the pleasure of choosing the flavors. The four tiers featured a little something for everyone, with four different cake flavors for guests to choose from! With the variety of lemon, chocolate mousse, vanilla with strawberry filling, and red velvet, we’re pretty sure no guest left cakeless. For an additional “ahhhhhh, how sweet!” note – the cake was created by McArthur’s Bakery in St. Louis, Missouri – the same bakery that Melissa’s family has been using for 50 years! The lovely images were captured by Tim McDermott Photography.